I keep seeing wonderful, exotic birds — who vanish exactly the minute I have my camera in my hand. Are they afraid of the camera? Does it look like a weapon? It’s eerie. I walk very quietly into the dining room and put the camera on, facing away from the glass. I turn around — they the one I wanted is gone. All the rest are there, but the Cardinal or that big golden woodpecker? Rainy morning squirrel. I do believe he’s shaking off the water! I love when they just lay down in the seeds and won’t be moved, no matter how many birds come and try to bump them off the feeder. 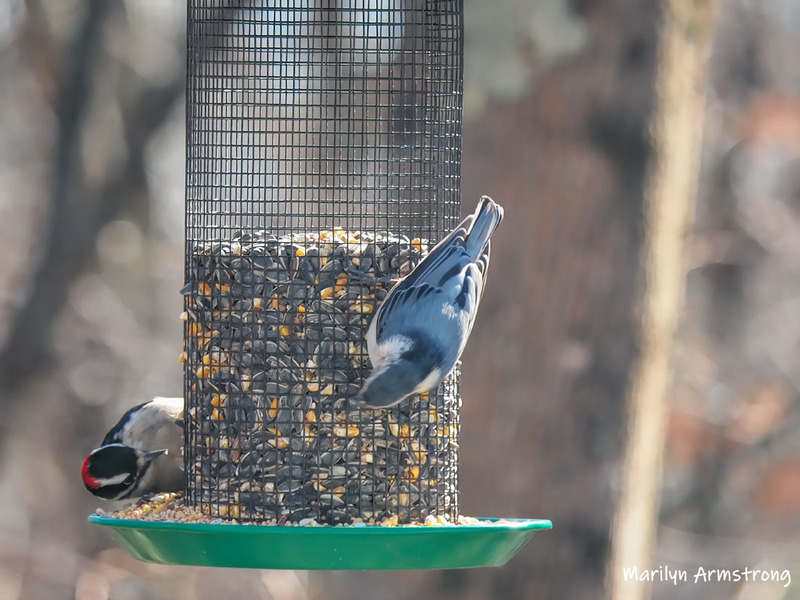 In this case, a nuthatch got tired of waiting while Mr. Woodpecker rolls in the food. Flown away. Gone with the wind or at least, a feather. A plump woodpecker. This one is a Hairy Woodpecker (pretty sure) because he’s bigger and has a long beak. I missed the big red papa but got a nice look at lovely mom. Not as showy as her scarlet mate, she is still a very pretty bird. 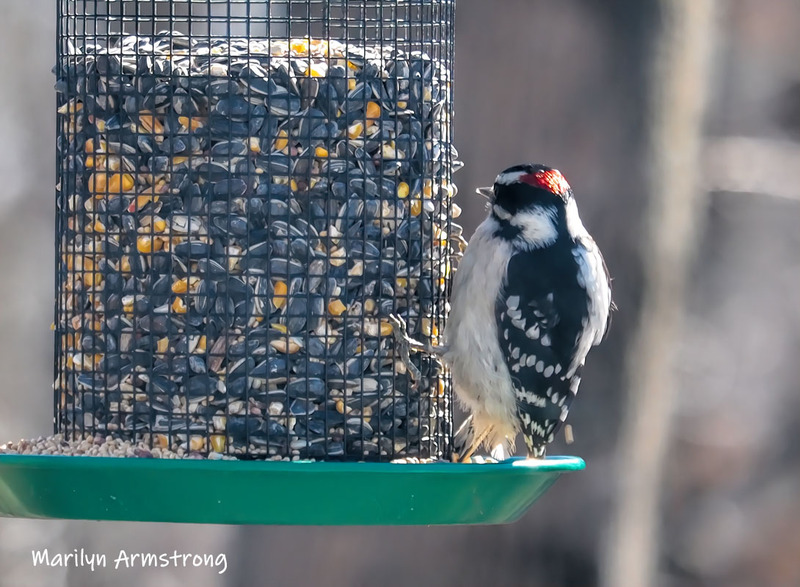 That being said, the birds who are used to the feeder are hanging around long enough for me to choose my shots, which helps. I have enough pictures — including ones I have yet to process — so I can pick and choose and hopefully, get better (or at least different) photographs. I took more than 2000 pictures in January. I decided I needed to slow down and take fewer pictures, but maybe more interesting ones. I never seem to delete enough. If it’s fuzzy, I dump it. The problem comes when the picture is fine but really, it look exactly like the other six. Keep? Delete? So I’m trying to slow down. I can’t shoot that many pictures. My computer won’t live to tell about it. External drives are the answer!!! I have them, but when I”m looking for a picture, I don’t feel like hooking up …. so I keep most stuff on the drive. Wow, that’s a lot of pictures! But there are some pretty boring photographers. I’m trying not to be one. Look at that! You got a photo I’ve never captured before in years of photographing squirrels… one shaking off the rain! That looks neat flying off in all directions! First I thought something was wrong with my lens, then I realized wow, it was rain. Cool! 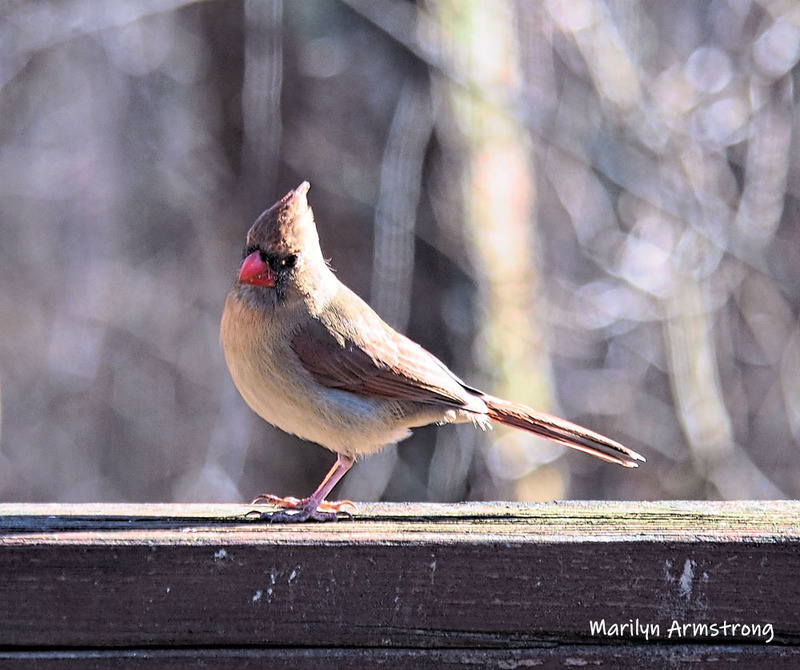 I think the mama Cardinals are quite lovely. Not as bright as the dad, but what a great combination of colors. Who’d think red and olive green would work in combination? 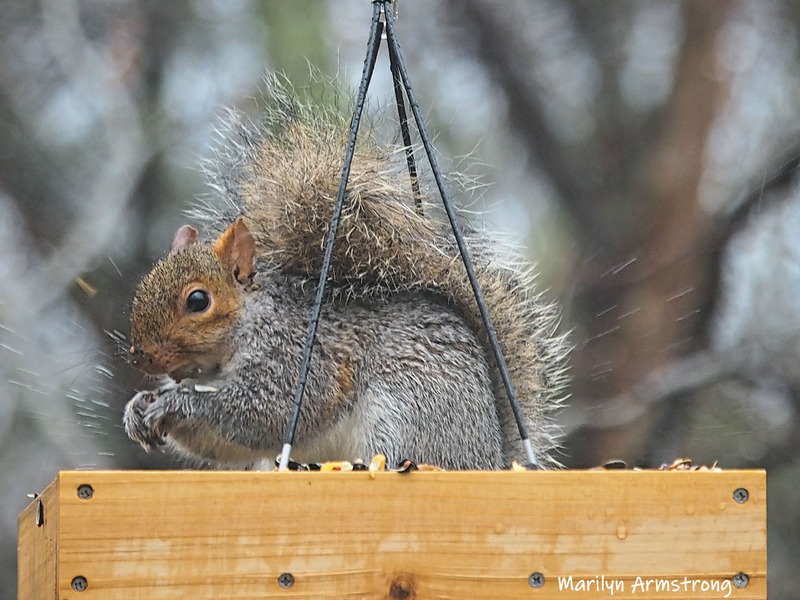 You can actually see the water coming off the squirrel – well done. I didn’t realize it was raining until I saw the pictures. It was a relatively light rain, but it came out really well in the photographs.